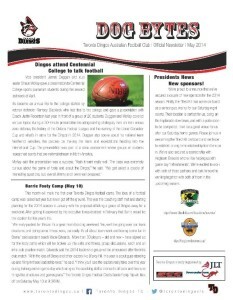 The latest edition of Dog Bytes, the Toronto Dingos newsletter is now available. This month's edition features some sponsorship news, an update on the Dingo training regime and gets up close and person with Alvin Ranchhod in the Player Profile section. As always, a glimse of the front page can be seen on the right, but for the full PDF version of the newsletter please CLICK HERE.